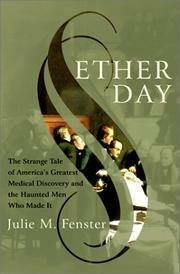 American Heritage columnist Fenster examines the tangled tale of the invention of anesthesia. Dava Sobel and Janet Gleeson have established a new model for authors working in the history of science—i.e., find some aspect of everyday life that we take for granted but whose invention involved a complicated story (preferably with something sinister attached to it), sprinkle with intelligent social history (to place it in a larger context), write well, and stir. Fenster has adhered to this formula nicely and the resulting work is, like those of her predecessors, a model of sound popular science. It begins with a simple question: Who was the father of painless surgery, as first practiced at Massachusetts General Hospital on October 16, 1846? The three claimants to the title are as dissimilar as any men of the era could possibly be. Horace Wells was a pious and earnest dentist who became interested in the possibilities of nitrous oxide as a way of rendering patients insensible; William T.G. Morton, who learned dentistry from Wells, was a semi-literate con man; and Charles Jackson was one of the most prominent men of science in Boston—an arrogant and rigid figure who claimed that Samuel Morse stole the idea of telegraphy from him. This trio became locked in a struggle to claim credit for the invention of anesthesia, a struggle that led all three to destruction. What each seems to have lost sight of is the importance of the advance itself; but Fenster is particularly good at reminding readers of the nightmare of surgery before anesthesia (she describes one operating room whose features included “hooks, rings and pulleys set into the wall to keep the patients in place during operations”). The cast of characters here is a rich one, including such luminaries as Ralph Waldo Emerson, Oliver Wendell Holmes, and Samuel Colt, not to mention cameos by Robert Southey, Samuel Taylor Coleridge, and Henry David Thoreau. Fenster balances all the various elements of the tale admirably and writes with acerbic wit. Despite occasional repetitions: a thoroughly compelling account, well told and well situated in its larger context.